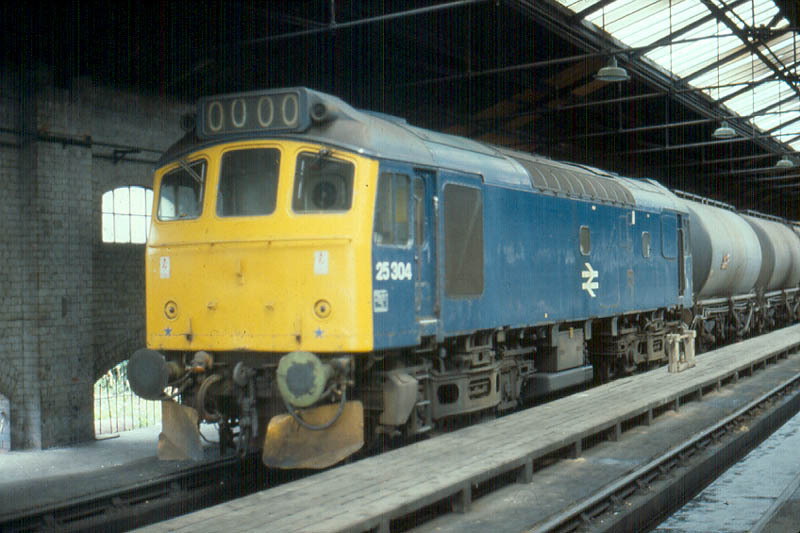 A slightly fuzzy view of snowplough equipped 25304 on July 28th 1979 as it sits in the long shed at Cockshute. The sixteen year five month career of D7654/25304 was spent allocated to a modest selection of London Midland Region depots. Built: Beyer Peacock, Manchester (Works No. 8064). Time between last Classified repair and withdrawal: 86 months. Time between withdrawal & scrapping: 30 months. August 1967 to Birmingham Division (D02). June 1968 to Stoke Division (D05). November 1968 to Nottingham Division (D16). November 1970 to Liverpool Division (D08). January 1971 to Manchester Division (D09). 25304 was the 155th Class 25 withdrawn, one of twelve retired during November 1982. 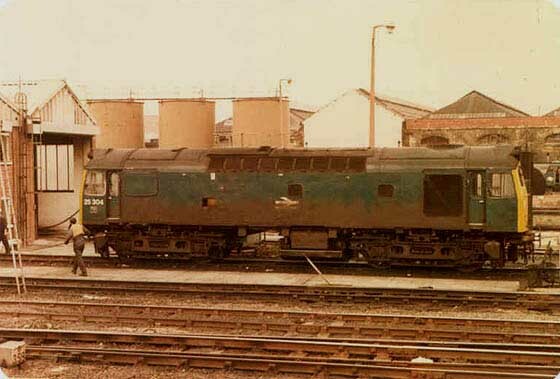 After withdrawal 25304 was stored at Crewe until moved to Derby Works during March 1983. On February 5th 1985 it moved to Swindon Works and was broken up there by the middle of June 1985. Noted Derby Works September & October 1971. Noted Derby Works April 1973. Noted Crewe Works September 1975 (full repaint). D7654 was one of a batch of seven delivered to the London Midland (Midland) Lines allocation, with D7654 placed into service during the last week of June. On September 3rd the 10.15 Glasgow Central - Euston was worked between Beattock & Carlisle by D7654, which had replaced D148. During September & October 7654 was present at Derby for repairs. 7654 was briefly at Derby Works during April. A new Freightliner service was established between Forders siding, Bedford and Trafford Park/Garston. The route out was via the Midland line and the Hope Valley route, returning over the WCML. From the beginning of the service Class 25s were used, with 7592, 7654/55 frequently being noted. On August 9th four parcels vans became derailed around midnight on the south end catch points of the down main south of Quintinshill. A train hauled by 86042 was propelling a failed freight train into Quinstinshill down loop. On reversing its train back onto the mainline the four parcels vans became derailed. The Carlisle breakdown crane was in attendance hauled by 25304 and rerailed two of the vehicles, the Eastfield breakdown crane took care of the other two derailed vans. Rerailing and other clean-up had been completed by midday on August 10th. 25304 visited Crewe Works for repairs during September, the following month it was transferred to Crewe, this was 25304's last transfer. On July 25th a Weston-super-Mare - Aberystwyth day excursion was worked roundtrip by 25304 & 25125. On June 19th the 09.42 Llandudno Town - Manchester Victoria was worked by 25304. 25304 was stabled at Crewe station on Sunday July 15th. 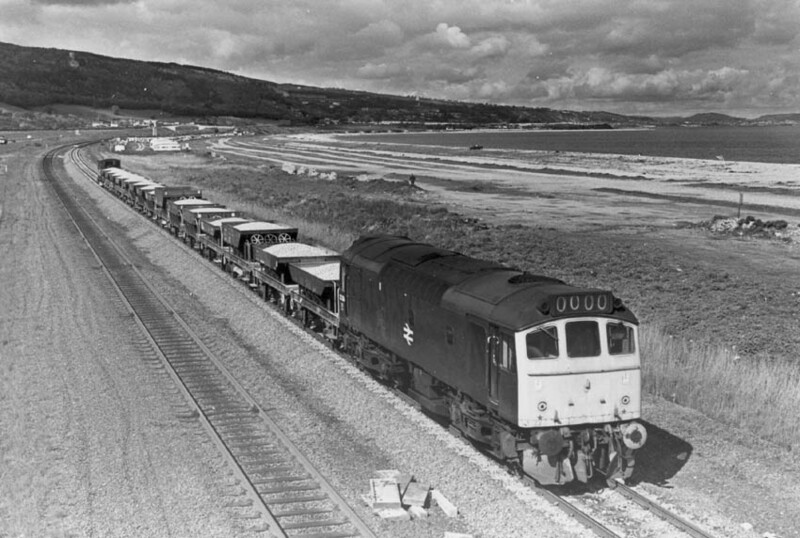 Photograph courtesy Larry Goddard A solitary hiker and one car fills the beach as 25304 approaches Abergele during 1979. On September 15th the 15.40 Manchester Victoria - Bangor was worked by 25304. 25304 & 25292 were stabled at Cockshute on October 4th. 25304 was stabled at Reddish on October 28th. The 15.15 Plymouth - Manchester Piccadilly was worked by 25304 between Gloucester & Birmingham New Street on November 20th. 25304 was stabled at Chester on December 16th. Two days later (18th) 40116 failed near Llandudno Junction with the 07.47 Manchester Victoria - Bangor, 25304 dragged the service to Bangor. 25304 & 40091 were noted leaving Cockshute yard with an up freight, possibly a lengthy engineers train on May 30th. 25304 was noted at Shrewsbury with a loaded ballast train on February 14th. 25304 was noted passing through Guide Bridge on April 16th with a load of empty 16ton mineral wagons. On May 16th the 'Salopian Steam Special' with 4498 required the assistance of 25304 up Miles Platting bank. June 27th saw 25304 & 25275 working the 07.40 Euston - Aberyswyth forward from Wolverhampton and returning with the 16.05 to Wolverhampton. On July 7th 25304 was noted at Northampton on a freight off the Bridge Street branch. 25304 worked an unidentified Blackpool North - Preston service on August 1st. Photograph courtesy Bill Richardson Its November 1981 and although the Eastern Region has long since given up its allocation of Class 25's they are still regular, though increasingly unpopular, visitors to much of the region. Seen here is 25304 at Gateshead Greenfield depot looking well worn with a good coating of grime on its sides. By this time next year 25304 will be withdrawn. 25304 was noted at Newcastle station on November 14th (attached to a diesel multiple unit?). 25304 was at Carlisle Kingmoor on February 13th. This would be the last summer in service for 25304, it managed quite a variety of passenger workings during this period. On June 19th 25304 & 25270 worked the 07.40 Euston - Aberystwyth forward from Wolverhampton, returning with the 14.00 to Shrewsbury. Unfortunately 25270 was removed at Machynlleth leaving 25304 to take the train forward alone. On July 31st the Manchester Victoria pilot - 25304 - was used to rescue an ailing diesel multiple unit on a late evening Manchester Victoria - Southport service. The Class 25 worked the train to Wigan where a replacement was waiting, 25304 then reversed its route to get the defective set back to Newton Heath. Four days later on August 3rd 25304 worked 10.45 Manchester Victoria - Holyhead and the return the 15.17 Holyhead - Manchester Victoria. 25304 worked a Manchester Piccadilly to St Pancras parcels (to Derby?) on July 22nd. 25304 was the Manchester Victoria pilot on July 31st and whilst on this duty it was called to assist the 22.35 Manchester Victoria - Southport multiple unit which failed west of Brindle Heath. 25304 took the unit to Wigan Wallgate, where a replacement was waiting, the Class 25 then taking the failed unit back to Newton Heath. On September 9th 25304 was noted at Severn Tunnel Junction with possibly the 14.30 6M35 13.10 Westbury Up Yard - Ellesmere Port East Sidings mixed freight, comprised of about thirteen vehicles (high sided hoppers and oil tanks). Somewhat off the beaten track on September 17th 25304 covered for a diesel multiple unit failure on the 16.33 Cheltenham Spa - Swindon! The next day (18th) it was coupled to 25194 to work the 07.40 Euston - Aberystwyth forward from Wolverhampton, coming back with the 14.00 to Shrewsbury. By the 27th it was on the 04.27 St Pancras - Derby newspapers, on the 30th it was on the 15.02 Manchester - Bristol parcels which included some preserved stock. Possibly the last passenger working for 25304 was on November 2nd when it rescued a Morecambe - Leeds diesel multiple unit, bringing the service into Leeds. 25304 was withdrawn in November and dumped at Crewe. 25304 was withdrawn on November 28th 1982. In February withdrawn 25304 was moved from Crewe to Derby Works. 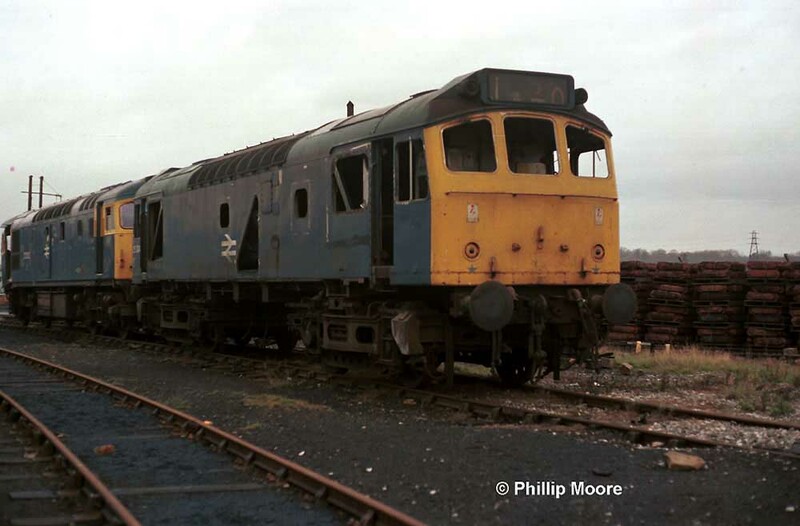 Photograph courtesy Phillip Moore There is little doubt here for the fate of 25304, with 27203, seen here at the back of Derby Works on November 26th 1983. Only the end will not be at Derby, another fifteen months will pass until 25304 is dragged off to Swindon Works for final scrapping. After three years rotting at Derby 25304 became one of the hulks towed to Swindon for final cutting, the movement took place on February 4th & 5th and included 25036/049, 25150, 25228/253/277 25304/317/320 as the 9X12 Derby - Swindon. By the middle of June 25304 was no more. No.1 cab: driver's cab side: unusual position of TOPS panel, below the number but almost flush with the corner: September 1975 until withdrawn. Three piece miniature snowploughs fitted: February 1979, July 1979, Not fitted October 1979. Passenger workings courtesy Alan Baylis (www.class25.info). Page created February 2nd 2002. Page updated June 24th 2018.